This week we’ll be tasting our homemade goat cheese so you’ll get to hear all about how it came out! (http://mferraro73.tumblr.com/post/99075294173/making-goat-cheese-over-the-weekend-we-tried-our) The wine we chose was a raffle prize from my work Christmas Party. I’ve never opened an “older” bottle of wine so I was apprehensive but also excited! In order to prepare for drinking this wine, I opened it 2.5 hours prior to our wine pairing. I wasn’t really sure if this was actually considered an older bottle of wine so I’ll probably post this question to one of the wine message boards. From what I’ve read, if a wine is older you should let it “open up” and also check for sediment that may need to be decanted out. This wine didn’t appear to have any sediment. Now onto the tasting notes… The wine was a dark color with a clear rim around the surface of the wine, one of the traits of an older wine. As far as aromas, I noticed Earth, a hint of fruit and a hint of chocolate while Neil found berry and cassis. For flavors, Neil identified a “delicious berry syrup” with a hint of smokiness, some spice in the throat and a full-bodied flavor. I tasted a dry wine with tart fruit, and Earth. At work we currently carry the 2008 vintage of this wine but I’m not familiar with it’s tasting notes. Perhaps we’ll try a newer vintage of this wine for a future Wine and Cheese Friday? The Belle Chèvre goat cheese didn’t have much of an aroma to me but Neil said it clearly smelled like goat milk. The texture was dry, crumbly, spongy, and looked like play doh although it did melt into a creamy texture while you were eating it. I enjoyed the amount of salt in the flavor and Neil liked that it didn’t have a “funk in your face” flavor. We both agreed that it definitely had a good flavor, of course, we are probably biased. When making the cheese, the directions suggested using 2tsp of cheese salt but gave you the option of using more or less. We decided to stick with the 2tsp and apparently it worked for us! 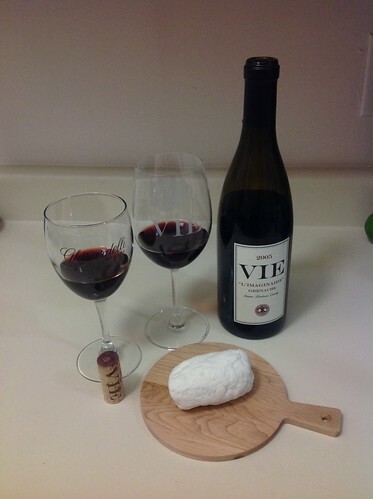 When pairing the L’Imaginaire Grenache and the goat cheese, I noticed more fruit in the wine with an increased sweetness and found the cheese to be a little more dry, and mild-flavored with a hint of sweetness. Neil thought the tart berry flavor in the wine increased and the salt in the cheese was more obvious. Since there weren’t any major differences in the wine or cheese, I’d prefer to enjoy them separately but Neil did find it to be pleasant pairing. We didn’t finish all of the wine that evening so we were able to try it again after it had been open overnight. The flavors were similar but the richness of the wine definitely increased! Very nice!